Hey my name is Lindsey, and I have been around birds around all my life. All sorts from macaws to red rumps, to peacocks to chickens, and even ducks. Me and my mom also take in injured birds and release them back into the wild, that is if they are well enough. The last bird we took in was a pileated woodpecker which was rather interesting to have around the house for a few weeks. 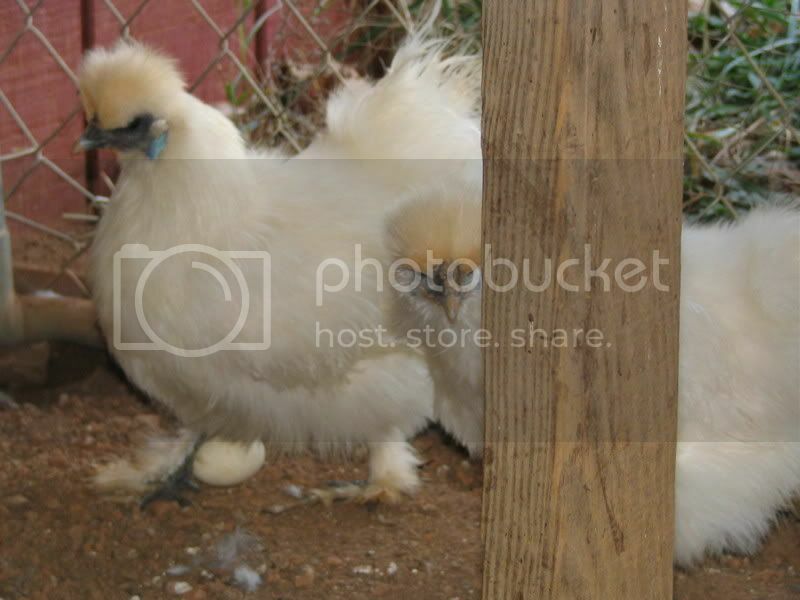 I would love to get some brahma chickens, sometime soon. I love all animals and have never had less then 10(excluding chicken numbers) running in and out of the house(yes they all get along fine with a chihuahua as head of the household) I will post some pics of the animals soon!! As of now we have 3 dogs, 5 cats, green wing macaw, Congo African grey, and down to 3 chickens and what ever hurt wild life that needs care, excluding opossums. Me and my mom stopped for bird seed at some back country store. I stayed in the car, and my mom went in. I saw the sign for "chicks for sale $1.75. When momma got into the car i talked her into bringing home 4 baby chicks, Dominekers as they are called out here. One of the chicks we named Gertrude. This chick loved millet, yea i know what chick doesnt. Gerdy ate the most, she began to get big very bad, but big as in wrong direction big. She smothered Rocky, my baby rooster. This chick became SSOO fat she could not walk, or even stand up. (I am serious!) So how to fix this problem of the super fat chick? We had to take away her beloved Millet, and do "chicken exercises" with her. We had to pick her up and hold her up move her across the floor so that she could start burning off all her fat. 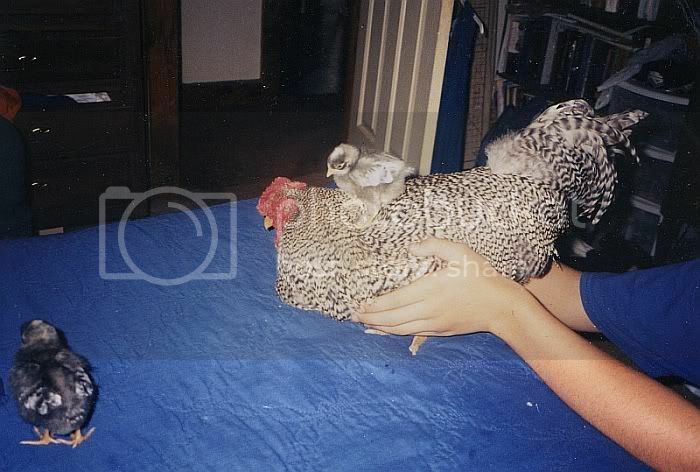 This chick was under constant care, and in constant hands. She lost her weight slowly, and we soon gave her limited amounts of millet. 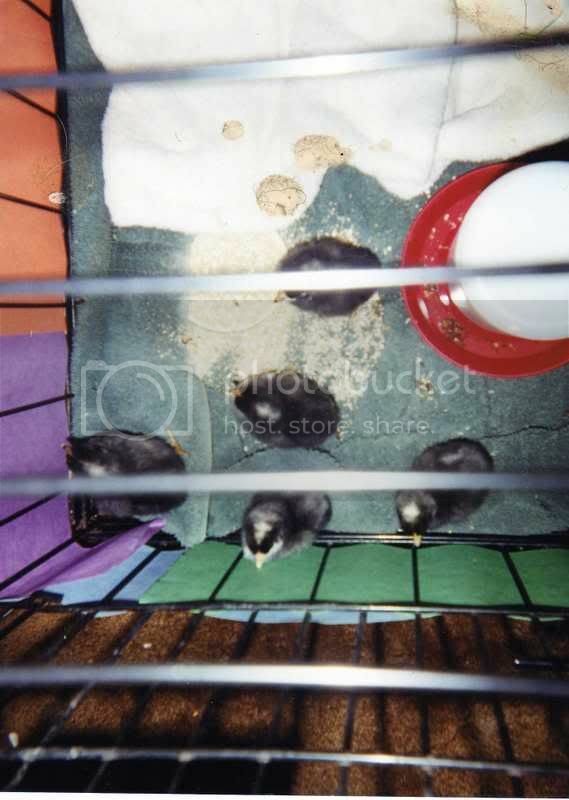 When the chicks got big enough they were moved outside, this ment quiet nights for me, since they stayed in my room. 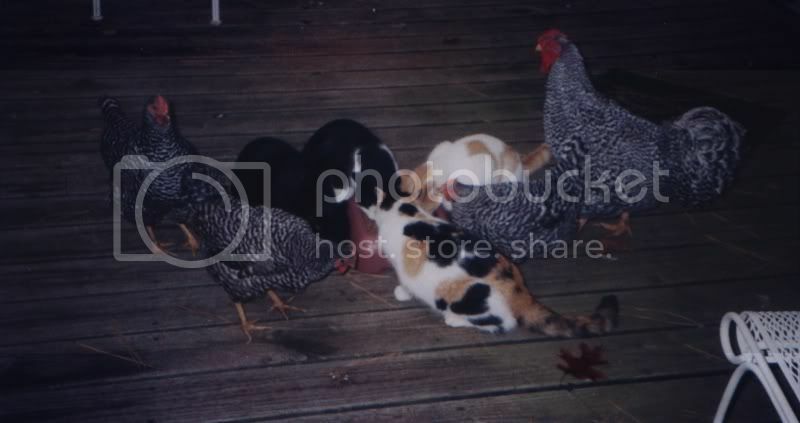 Gerdy remained ever so spoiled, and soon became the top of the pecking order, yes she was over the roosters. 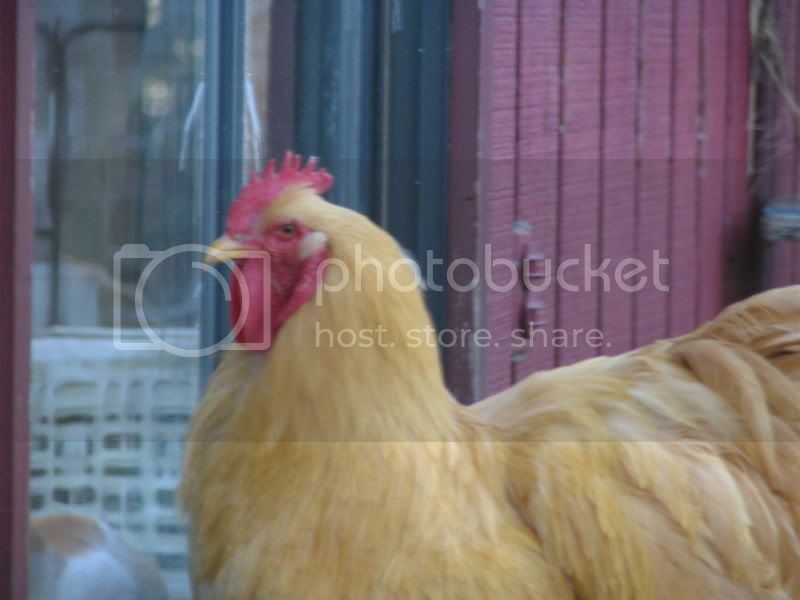 The chickens would walk freely into the house and visit. During the winter they sat outside our sliding glass door wanting to come in. The first snow came and me and my family gathered outside to let the chickens out. (This was a huge event for us) Gerdy refused to come out, and we had to pick her up and put her in the snow. she didnt like it and flew on my dads shoulder. 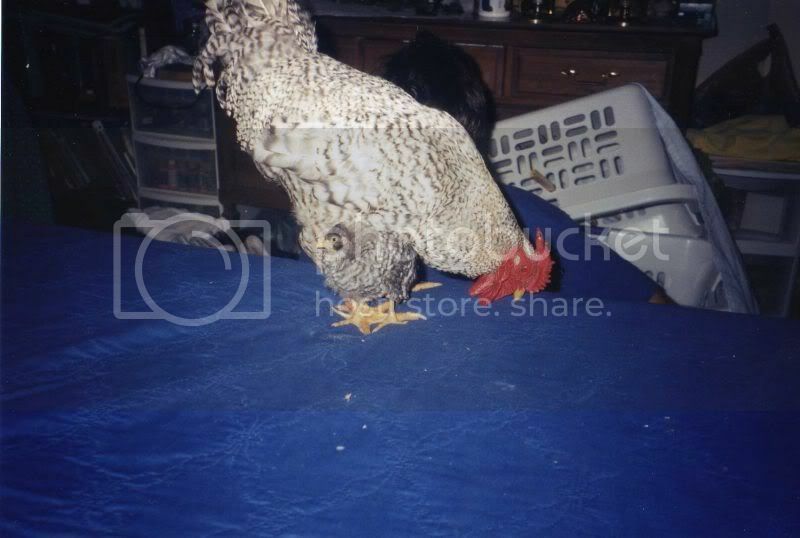 Gerdy lived to be 5 years old, our oldest living chicken. All her life she remained ever so spoiled and loved to be around people. If she felt in danger she would run behind one of us and stand at our feet, she knew we would protect her. Her 5 years she remained the head of the pecking order.